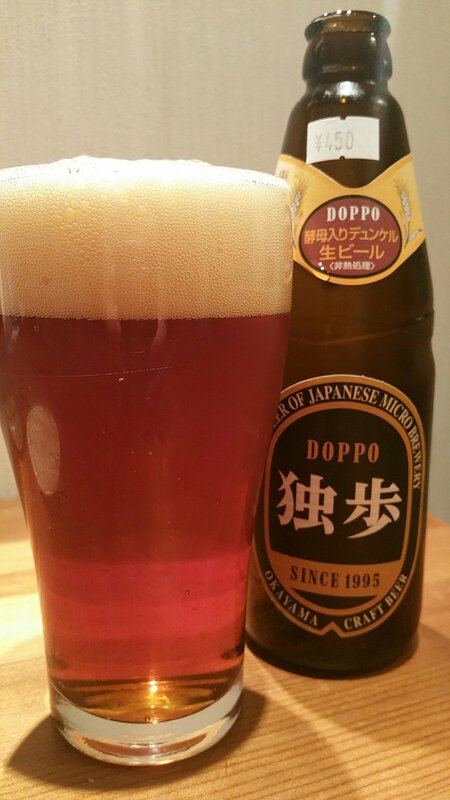 Doppo Dunkel is a 5% dunkel beer from Miyashita Shuzo, based in Okayama, Japan. It’s part of their all-year round range and can be found in both bottles and on draft across Japan. And that’s the description for this beer. Sorry ladies and gentlemen. Doppo Dunkel poured out a light copper brown colour with a large thick frothy white head that took a while to settle down. Heck, you could have put a chocolate bar in the head and it would have stuck upright it was so thick. When it did eventually settle down to something drinkable, Doppo Dunkel had a weak earthy hop and caramel malt aroma that felt limp and soft in comparison to other dunkels I’ve drunk in the past. Even when it had warmed up towards the end of drinking, the aroma didn’t develop any potency or strength. Doppo Dunkel had a low amount of carbonation which was strange considering the amount of head that developed from pouring the beer. With Doppo Dunkel, it’s all about the malts and they bring a caramel sweetness to the part that is unabating, and rather, well bland in the end. It’s all well and good having some caramel flavours in a beer, but when that’s all you’ve got, it does get boring after a while. The only real thing of note to Doppo Dunkel is how watery it is and lacks a decent body to hold it up. It finished with a slight bitter flurry to it but by that time it’s too little, too late. Doppo Dunkel is a meh beer for me – one to tick off to say I’ve tried it but won’t be going back again.